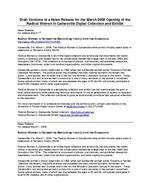 Draft versions of a news release for the March 2008 opening of the Radical Women in Gainesville Digital Collection and Exhibit, written as part of a student internship with the UF Digital Collections. Draft Versions of a News Release for the March 2008 Opening of the Radical Women in Gainesville Digital Collection and Exhibit News Release For release March 1st. Radical Women in Gainesville: Reclaiming History from the Grassroots http://www.uflib.ufl.edu/UFDC/?s=RWG Gainesville, Fla. March 1, 2008. The Radical Women in Gainesville online exhibit officially opens today in celebration of Womens History Month. Radical Women in Gainesville is an online digital collection and exhibit site that documents the valiant history of feminists who helped reform the conservative Gainesville college town in the late 1960s and throughout the 1970s. The collection is comprised of photos, oral histories, self-published newsprints, newsletters, brochures, notes from feminist or ganizations, and other original documents. Gainesville womens history dates back to 1968, when two Gainesville women wrote Towards a Female Liberation Movement, the political essay that pr opelled the static national womens movement into action. Local women also founded one of the first five Womens Liberation Groups in the nation. Today, Gainesvilles rich and active womens community is one of many remnants of the womens movement. Some radical women, many of which are now betwe en the ages of 50 and 80, still actively participate in local NOW chapters and in other organizations. Radical Women in Gainesville is a developing collection and exhibit site that memorializes the work of local radical feminists while preserving historical docu ments for future generation s to access for research and empowerment. The collection continues to grow as local women contribute their personal collections to the repository. For more information or to schedule an interview with the exhibit curator, contact Leila Adams or the University of Florida Digital Library Center at dlc@uflib.ufl.edu or 352.273.2900. Radical Women in Gainesville Digital Collection: http://ufdc.ufl.edu/rwg Radical Women in Gainesville Exhibit: http://ufdc.ufl.edu/rwg/letter News Release. For release March 1, 2008 Radical Women in Gainesville: Reclaiming History from the Grassroots Gainesville, Fla. March 1, 2008. The Radical Women in Gainesville online exhibit officially opens today in celebration of Womens History Month. Radical Women in Gainesville is an online digital collection and exhibit site that documents the valiant history of feminists who helped reform the conservative Gainesville college town in the late 1960s and throughout the 1970s. The collection is comprised of photos, oral histories, self-published newsprints, newsletters, brochures, notes from feminist or ganizations, and other original documents. Gainesville womens history dates back to 1968, when two Gainesville women wrote Towards a Female Liberation Movement, the political essay that pr opelled the static national womens movement into action. Local women also founded one of the first five Womens Liberation Groups in the nation. Today, Gainesvilles rich and active womens community is one of many remnants of the womens movement. Some radical women, many of which are now betwe en the ages of 50 and 80, still actively participate in local NOW chapters and in other organizations. Radical Women in Gainesville is a developing collection and exhibit site that memorializes the work of local radical feminists while preserving historical docu ments for future generation s to access for research and empowerment. The collection continues to grow as local women contribute their personal collections to the repository. For more information or to schedule an interview with the exhibit curator, contact Leila Adams or the University of Florida Digital Library Center at dlc@uflib.ufl.edu or 352.273.2900. 2008 March 1 News Release. For immediate release. Radical Women in Gainesville, Making History March 1, 2008 The Radical Women in Gainesville online exhibit officially opens today to open the University of Florida Libraries Womens History Month Celebration. The Radical Women in Gainesville collection and exhibit sites represen t radical feminists involved in the grassroots and separatist strands of the local moveme nt. Radical feminist organizations are less likely to have coherent histories as most of their institutions quickly close down in resistance to mainstream values, leaving the task for the ethnographer to comp ile the historiography from movement documents and participants. The Radical Women in Gainesville online exhibit showcases the new Radical Women in Gainesville Digital Collection, which documents the valiant hist ory of women in the Gainesville Women's Liberation Movement. The collection is comprised of photos, oral histories, self-published newsprints, newsletters, brochures, notes from feminist organizations, and other original documents. While commemorating the uppity women who helped reform the conservative Ga inesville college town in the 1970s, this Digital Collection also preserves artifacts for future generations to access for research and empowerment. The Radical Women in Gainesville online exhibit and collection are growing and will expand to include Radical Women throughout Florida to reclaim and preserve the history of the Women's Liberation Movement. More materials are being added as they ar e located and Internet Distribution Permissions are obtained. For more information or to schedule an interview with the exhibit curator, contact Leila Adams or the University of Florida Digital Library Center.